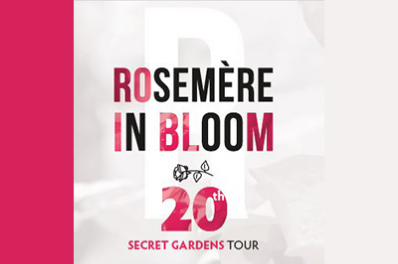 ROSEMÈRE, March 27, 2019 – Rosemère's Secret Gardens Tour will be celebrating its 20th edition this year! For the occasion, the Town is pleased to be collaborating with Larry Hodgson, the renowned horticultural columnist and specialist, who will serve as patron of this event. Another new feature this year: the Secret Gardens Tour will be held for a full weekend instead of just one day. Residents will therefore have the opportunity to many of Rosemère's private gardens! "For the past few years, I have been taking part in Rosemère's Secret Garden Tour. I am always amazed by the beauty of the gardens and I can see that flowers are an integral part of Rosemère's DNA! So it is with great pleasure that I agreed to be the patron of this event to mark its 20th edition!" mentioned Mr. Hodgson. This activity will take place rain or shine on July 13 and 14, 2019, 9:30 a.m. - 4:30 p.m. Visitors who wish to take advantage of this opportunity to get in a bit of exercise as well will be able to enjoy the tour by bike. At lunch time, you are invited to bring your picnic to Hamilton House, where musicians and painters will also be on hand. Tickets cost $15 per day or $20 for both days. "Year after year, the Secret Gardens Tour is eagerly awaited by everyone who loves gardening and horticulture in general. We are proud that Mr. Hodgson has kindly agreed to serve as patron to mark the 20th edition of this event. Residents who love flowers and greenery will definitely be impressed!" commented Eric Westram, Mayor of Rosemère. As it may be recalled, all proceeds from the tour will be donated to the Les Petits Plaisirs respite organization. This group, which has been active in the region for a number of years, provides families whose child has a disability with access to certain services that are essential to their quality of life. This activity will therefore not only delight you with all its splendour, but it is also devoted to a humanitarian cause that is very important to our town.